- Includes 160-degree adjustable chute and safety key lock. Get ready for the snow and a great gift idea for Dad! 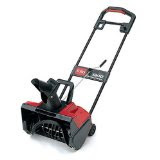 He can clear driveways, walkways, and patios quickly and easily with the Toro 1800 Power Curve Electric Snow Thrower. Compact yet powerful enough to toss snow a distance of 30 feet. Easy to operate and maintain, so he can enjoy the next snowfall without having to worry about whose turn it is to shovel.